This week on the unSeminary podcast, I was honored to welcome the Associate Dean of the College of Liberal Arts and Sciences and Associate Professor of Communication at Azusa University, Dr. Ryan Hartwig. I first met Ryan while he was doing research for a new book. He visited with me on today’s podcast about that book which he co-authored with Warren Bird, and which was recently released: Teams that Thrive. Ryan grew up in the church as a “Pastor’s Kid” and he married the daughter of a pastor, so he has a great love for the church. Ryan believes the church is the hope of the world, as Jesus leads it. This belief is his motivation to supply congregations with resources. He spent many years as an administrator and as a team-builder and team-leader, coaching people on team-leading. In the last several years, Ryan started to study teams. His day job is teaching young people to go out and make a difference working in collaborate organizations; his research is helping people work in and do those same things within the church. Ryan realized, as he was working on his doctoral dissertation with the leadership team of a large congregation, that there was no research available on senior leadership teams. His idea was to study and learn from churches trying to implement senior leadership, and use that information to help other congregations. What makes Teams that Thrive such a valuable resource is that it’s based on research, not opinion. The survey Ryan and Bird used is probably the best diagnostic survey available, developed by a former researcher at Harvard, Richard Hackman. Ryan worked with Hackman and obtained permission to offer that survey to all the congregations that participated in the survey for the book. The tool helps churches measure how well they are doing in terms of leadership. In collecting data for the book, Ryan and Bird heard from over 1,000 leadership team members, from over 200 churches all around the world. 145 churches had at least 75% of their leadership team complete all the required assessments. What makes this research especially unique is that not just one person was asked how the team was performing. The entire team was asked, and that information was then aggregated and analyzed to see what could be learned. Are convinced that shared leadership is a Biblical way to lead and a preferable way to lead. Are willing to do the fundamental disciplines day in and day out to enable their team to thrive. Certainly, God does give vision to one leader. But He doesn’t give all of the vision to just one person. The beauty of a leadership team is that it recognizes that God speaks to everyone. So why would we limit ourselves to only hearing God speak to one individual and not to many? How can we use the different perspectives, different expertise, different experiences that we have, to ultimately be able to make better decisions and implement better ministry throughout the church? Teams that Thrive does not suggest that a leadership team precludes someone from providing strong leadership. In fact, many teams do have strong leaders. There’s nothing wrong with that. But a leader should not be so strong that that leader precludes others from being able to contribute fully to the team the gifts that God has poured into them? Do you feel challenged? Curious? Motivated? 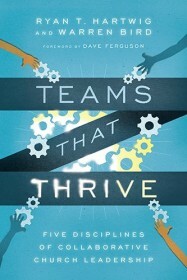 To learn more about Teams that Thrive, you can visit teamsthatthrivebook.com. Not only can you grab the book on this site, there are also great ideas and resources there, including a free assessment tool that you can print out and pass around at your church. Use this to evaluate how your church is doing in the area of teams and then talk it out. Use it to thrive! 00:36 // Rich introduces Ryan and welcomes him to the show. 01:06 // Rich introduces us to the book Teams That Thrive. 01:38 // Ryan tells us his story. 02:52 // Ryan talks about the ideas behind his decision to partner with Warren and write Teams That Thrive. 04:07 // Ryan talks about the Team Diagnostic Survey and how that helped with his book. 06:00 // Rich compares Teams That Thrive to Jim Collins, Good to Great. 06:33 // Ryan talks about some of the findings from the research. 08:00 // Rich welcomes Warren Bird to the show. 08:52 // Warren talks about the research. 10:11 // Ryan talks about the strength and impact of the team as opposed to one individual. 11:35 // Warren talks about the process of leadership development. 12:22 // Rich talks about the impact of the coaching his leadership team received from Ryan and Warren. 13:24 // Warren congratulates Rich on Liquid Church and the senior leadership team. 14:38 // Ryan gives two profile leadership examples that standout for him. 16:50 // Warren offers an additional example of great leadership. 17:51 // Rich talks about the process of sharing leadership at Liquid Church. 19:03 // Ryan talks about growing churches and the challenges they face. 20:15 // Rich gives an example of a challenge faced at Liquid Church related to growth and development. 21:42 // Ryan offers some guidance to churches when working through the decision making process. 22:43 // Warren offers website information. 23:15 // Ryan talks about the team assessment option on the website. Rich – Hey everybody, welcome to the unSeminary podcast. My name’s Rich the host around these parts. We’re so glad that you’ve decided to spend some time with us today. We know you have a lot of things you could be doing as you get ready for this weekend at your church and we’re just honored that you’d take some time to be with us. Today I’m honored to have, he is… I’ve got to get his official title here, he is an Associate Dean of the College of Liberal Arts and Sciences and an Associate Professor of Communications in the Azusa Pacific University. Super excited. Here we are in the unSeminary podcast actually talking with an actual, someone who’s qualified to actually talk about things, an actual doctor, Ryan Hartwig. So glad to have you on the show today Ryan. Ryan – Thanks so much for having me Rich, this is great. I’d like to chat with you about our book and so on. Rich – Nice. So Ryan wrote this book with Warren Bird called Teams That Thrive and it’s a fantastic book. Warren’s been on the show in the past. I’m a big Warren Bird fan and actually I met Ryan while they were doing research for the book and they came out, they were looking for teams that didn’t thrive, so they came here looking for church and spent a day, or a couple of days actually I think it was, it seemed like a long time. It was fun to actually see the book released but why don’t you tell us a little bit about yourself first, kind of give us the Ryan story and then we’ll jump into the book. Ryan – Sure yeah. Rich, I’m a practical academic, yeah I’m a prof but really what I want to try to do is take these ideas and the academy and try to bring them to real people, facing real challenges and real organizations. So I spend my time really trying to engage the church. I grew up in the church. I’m a pastor’s kid, then I married a pastor’s daughter and so I just have a great love for the church. I think the church is really the hope of the world, right, as Jesus leads the church. So I want to try to do what I can do, to try to resource the church. So I spent many years as an administrator and as a person who’s building teams and leading teams, coaching people on doing teams and then in the last several years, I just preferred to study them and so on. So it’s great. My day job is, I get to teach here and get to teach young people to go out there and to make a difference in the world. Really I’m trying to help them learn how to work in teams, both collaborative organizations and so on. Then my research work is trying to engage the church and help folks in the church to do those things as well. Ryan – Yeah that’s a great question. Actually when I was doing my PhD I did my dissertation with a leadership team of a really large church and as I did that study, as a kind of qualitative, in-depth case-study kind of study, I realized that there was really no broader research on senior leadership teams. Rich – Yeah so give us a sense of the study. What did you actually… how did you get out and talk to churches and what did that process look like? Ryan – Yeah a great question. You know, we really wanted to not just take from churches, but we wanted also to give to churches. So there’s a former researcher out at Harvard who has done some incredible work and he developed the Team Diagnostic Survey. It was Richard Hackman. So that’s probably the best diagnostic survey that’s out there. So I went and worked with him and got his permission to offer that survey to all of the churches who would participate in the study. So we were able to give back to all of the churches. Over 145 churches actually completed all aspects of the study and we were able to give to them this diagnostic tool to kind of measure how well their church was doing. But then to collect that data we also asked a bunch of other questions, about the way that they interact in their leadership team, who serves on that leadership team and so on. So we would take all of that data, collect all of that data and put it together and really learn some interesting things. So we actually heard from over 1000 leadership team members, from over 200 churches, really all around the world. Now most of the churches were in the US but we also had a few that were from all around the world and as I said before, 145 of them completed everything that we asked them to do, which meant that at least 75% of their leadership team filed out those assessments. So I think what’s unique about our study is, we don’t just ask one person on a leadership team to tell us how the team’s doing, we’re asking the whole team to tell us how the team is doing and then kind of taking that data and aggregating that into some groups and then seeing what we can learn from that. Rich – You know, part of what I think is great about the book is, it is researched based. So it’s unlike, you know, if I was to write a leadership book it would mostly be, “Hey here’s some opinions on what I think.” This book tries to drive into, okay let’s understand what’s actually happening with teams that thrive. But then you’ve added in, you’ve kind of augmented with great stories and examples and tried to fill that story out, so it puts some flesh on those bones. It reminded me a little bit of, almost like, and I don’t know if other people have made this connection, but almost like the kind of Jim Collins, Good to Great, or that kind of style of where you get the sense of like, “Okay this has like actual research behind it,” which is fantastic but then also trying to push forward with some great stories. Was there any, you know, maybe an example of a kind of common… an example of a story that kind of resonated with you, like an example of some of the things that teams that thrive actually do from a leadership point of view? Ryan – Well thanks for the compliment. I guess if our work could be anywhere near what Jim Collins is doing and so on, that would be great. We really did try to look at what does the research say, but then not just write kind of a very ‘researchy’ book, you know, we wanted to have it grounded but not write that. So hopefully it came out that way. What do we find? Well there’s so many things we find. Really we identified 5 disciplines and collaboratives in church leadership and I’ll kind of get into the 5 disciplines. But probably before that, probably if we could sum all of that up, what we realized is that teams that thrive are convinced that shared leadership is a biblical way to lead and is a preferable way to lead, was kind of the first thing. There was a strong conviction like, “We’ve got to figure out how to do this thing well,” that was the first piece. Then the second piece was that they were willing to do the fundamental disciplines, day in and day out, to enable their team to thrive. Rich – Very cool. Well we have a surprise guest join us on the podcast, if you’re watching the video you’d see Warren Bird jumped in. Warren the coauthor of Teams That Thrive is also joining us today, Warren welcome to the show. Warren – Thanks. Ryan I love what you’re saying, I can’t wait to read that book. Rich – That’s fantastic. So Warren just to bring you up to speed. We kind of talked a bit about the research process that went on, which you, I’m sure, had a part to do with. Then we’re just kind of getting into a little bit of what are some of those key insights that came out. For you Warren, as you talked with and interviewed so many churches, 140 some odd churches that ended up giving you all the information, what were some of those insights that jumped through to you as patterns, as you interacted with different churches? Warren – Affirming everything that Ryan said, I just became convinced that everybody wants to do team but they don’t know how to do it well and they don’t even know, “Are we doing it well?” They don’t even know. We started the book with like these myths that people think, “Well I guess a team means that we all advise the pastor, then the pastor makes the decisions and you know, we’re working as a team.” No we are not. You’re losing huge potential if that’s how you approach the idea of team. In today’s fluidity of who’s on the team and who’s not, in our survey we were amazed at how many churches, the members of the team, disagreed with who was on their team. It was quite a stretch. Rich – So playing a little bit of the devil’s advocate here, so team leadership, that sounds like a, I’m playing devil’s advocate here, I don’t actually believe what I’m about to say, but team leadership that sounds like some sort of namby-pamby, wow, woo-woo deal. Doesn’t God give the vision to a person and then we’re all just supposed to march in behind that person right? Isn’t that the evidence of like a great thriving church? Ryan – Well sure, yeah certainly God gives the vision to people but it doesn’t give all of the vision to only one person. The beauty of a leadership team is recognizing that God speaks to everyone, so why would we just limit ourselves to only hearing God speaking to one individual and not to many? If we believe the spirit lives inside of us then he can speak to all of us. So the beauty, I think of the team, is being able to come together and saying, “Okay, what is it that God is saying to us? How can we use different perspectives, the different expertise, the different experiences that we have and ultimately be able to make better decisions and implement greater ministry throughout the church by sharing leadership together?” That’s really the idea there. We’re not suggesting that a leadership team precludes someone from providing strong leadership. In fact in a lot of the teams that we’ve seen there is a strong leader, that’s okay, there’s nothing wrong with having a strong leader, but not so strong that that leader precludes others from also being able to fully contribute the things that God has put into them. Rich – Interesting. Now Warren, you’ve been studying leadership and looking at leadership over a number of years, is there anything in this, in what you’ve found here that you feel like is kind of a shift, either culturally or kind of generationally? Are you seeing any differences on that front? Warren – Yeah the whole idea of leadership development, this is just one more piece of it. On your team you don’t hire pre-trained people who have all got it together, it’s a team growing together, getting better together, making better decisions with a better process and building into each other. So in a way, this models what you hope the whole rest of the church will be all about. We’re forever taking people, to use a Willow Creek expression, from total pagan to a dedicated missionary and that being part of a team is different steps on that journey. Rich – We had the privilege, I had mentioned this earlier, we have the privilege when you were in the process of writing this book, to sit down and spend some time and it was actually great. I loved the coaching that you both provided to our team and actually to this day, one of the things that Ryan said, kind of a challenge to us as a lead team, he said, “You know, you need to not answer all the questions. You need to allow some of the questions to hang and you need to create space for people to… to maybe deliberately allow a few things to kind of hang out there, create some space, so that your leaders who are around you will rise up and help and obviously push the mission forward,” which actually that has continued to shape our thinking over the last couple of years. That was just one kind of piece of the overall conversation which I really appreciated. Tell us about some of the other churches that you ended up highlighting throughout the book. Is there any others that stick out for you Ryan? Warren – Before Ryan answers, let me just brag on you guys at Liquid Church. That was so… you were in this survey and then we kind of picked the top 10% of churches and tried to visit different ones and that was you and I have to say, I’ve sat in a lot of church senior leadership team meetings and yours was distinctly different in the engagement level, in the by-in, in the use of the different people’s talents, in the humility that you expressed, in the [Inaudible 00:13:58] core. So I just want to cheer that that was a great day for us too, to be able to learn from you and you’re really different from a lot of churches that really struggle. I say all of that to say, it can be different. Churches can incrementally come to that kind of thing where team members look forward to interacting with each other and taking another step in their journey of leading God’s church. Ryan – Yeah, two quick thoughts there and I don’t remember if we actually named these churches in the book or not, so I won’t use their names. But two I think, two kind of senior pastor profiles a little bit, in terms of how they have tried to build these teams. One of the pastors realized that his predecessor was this very, very organized guy, who would have, in any sort of event, he would kind of pull out the color coded red sheets and assign everyone a task and so on. Everyone would just kind of march out those orders and as he took over the church he really realized that that was preventing, even though the team was able to be kind of cohesive in the sense of marching out orders, was really preventing all the team members from offering their best to the team. So he realized, “Okay, I really have to back off a little bit on some of this direction that I’m offering,” so he stepped back. So there was a time when there was kind of a hole in their small group’s ministry. This is a very large church, about 5000 people and there was a hole there for small groups. He said, “Okay, I’m going to take on small groups myself for this season of time.” So he led the small group ministries, the senior pastor of the church, in every facet. I think it was about 6 months to a year. I think it’s such a great indication of what healthy teams do, is that leaders say, “Okay what is it that the team needs right now and I’ll go in and provide that.” That senior pastor realized, “Okay the best thing for me to do, is to give up some of this more visionary kinds of things to others and let me step into this place and provide leadership to our small group ministry, in a way that he was kind of accountable to the other team members for small group ministry during that time. Warren – Let me give one more example if I could. Journey Church, Newark, Delaware, Ryan and I did separate visits on that. When Ryan was there he captured the senior pastor, Mark Johnson saying, “You know, I used to lead the church but now I lead the team as they lead the church.” So on my visit I met some of those team members and I thought, “Here’s a 30 year old woman who’s overseeing kind of the assimilation piece of the welcome, ‘how do we get you connected’? She has been really mentored and given challenges and invited to rise to the challenge and I thought, that just being one case of, okay pastor Mark, if that’s the kind of people you’re leading and they’re rising to the challenge, you are just multiplying yourself. Ryan – Oh absolutely, yeah. Rich – Yeah, one of the things I’ve found in just our little world is, as we take new ground, as a part of that 4 part leadership team, senior leadership team, whatever we want to call it, as we take new ground, by definition we’re moving into areas, that it’s not really clear whose responsibility it is. That there are these areas where we’re doing new things, we’re trying to innovate, we’re trying to make something happen and it kind of requires all of us on that team. We all have to pitch in. You know, Tim from a teaching vision point of view, he’s got to talk about it. Dave from kind of a finance point of view, he’s got to figure out, how are the teams going to plug into this whole thing? So you do end up having… in fact I’ve just had one this week with Dave where there is this like, “Okay so what part of this is yours and what part of it is mine?” because we don’t want to step on each other’s toes. We’re not trying to like offend each other but we have to kind of be cognizant of talking through the actual process of how we are going to lead, not just go ahead and lead. Like how do we actually, how are we going to make this thing happen, because there’s enough potential there to rub each other the wrong way, which for me is exciting because I’m like, “Hey we must be trying to do things that aren’t just natural, don’t just happen independently,” so we’re just kind of cool. Like in your case, because you’re growing there’s this unknown stuff that’s out there, causing you and Dave to sit down and have conversations that you would otherwise not have to have. Now because you and Dave are working through these things and making decisions together and you’re making decisions that are benefiting from both of your perspectives, you’re growing in your capacity as a team, which is then fueling the church’s ability to grow and so on. Just one of the things we’ve found is that the best teams tend to make decisions together rather than to have individuals who make these really key strategic decisions, but instead they do it together as a team. Now functionally what that means is we end up talking a lot. You end up having a lot of conversations about things, but I think we all honor that and I think it’s a positive way to move forward as we try to grow and develop and try new things, because the reality of it is, if you’re a growing church,0 a lot of times you’re in the largest church you’ve ever been in, let alone worked in the largest church you’ve ever been in, so it’s all unknown territory for most of the people around the room. So that’s exciting. Ryan – Can I comment on that real quick Rich? Ryan – I wouldn’t want anybody to hear this and say, “Okay well you’re saying that we used to just advise the senior pastor and he’d make all the decisions but now we’ve got to make all of our decisions together.” That is not going to work out well, that is going to be exhausting. Now that creates attention for every decision. So I really encourage them to say, “Okay, what does it look like to just move the dial a little bit? What is it to even consider like, what would it be like to like [Inaudible 00:22:01] to collaboration? What have we thought about, like a portion right, maybe if it’s 10%, is it 10% or 20% of our time where some key strategic decisions we need to make, that okay, we’re really going to wrestle through these things as a team but the other ones we’re just going to kind of continue to go on maybe in the status quo. That way it’s not so exhausting, trying to figure out, how do you make this transition. So I do think you can kind of make some baby steps to get there. Rich – Very cool. Well this has been a good conversation. Is there anything else you want to share Ryan or Warren as kind of we close down? Obviously ultimately we want people to pick up the book, but are there any other kind of broad, kind of conclusions you’d like to share? Maybe Warren? Warren – Well they could pick up the book by going to teamsthatthrivebook.com because not only is the book there but there are a whole lot of resources and ideas and exercises and tools that we’re continuing to add to that website and Ryan overseas that. It’s just a great help for you, so that’s a nice way not only to get the book but to find out a little bit more. Rich – Very cool. Anything else Ryan you’d say as we kind of close it down? Ryan – I think along those same lines. Maybe a great place to start? Yes. Well yes is to buy the book but also maybe just to assess your team. We actually built a free team assessment, it’s available on that website, teamsthatthrivebook.com. If you just click on free assessment it will come up and we built this whole deal, we give you an opportunity, you can print this thing out and pass around to the members of your team and fill it out and have somebody collect those responses and then talk through those things. It might be a great starting point just to say, “Okay, how well are we doing? Do we really need to work on this? What do we need to work on?” and so on. But that’s available there as well. Rich – Very cool. Well that’s great, we’ll have links to that in the show notes at unSeminary and we’re also going to do an event in New Jersey this summer, which if you subscribe to unSeminary stuff you’re going to get email about it, but over the summertime we’re going to have Ryan and Warren together for a day, really trying to process through this content we’re talking about. So that would be a great opportunity for you to plug in as well. So teamsthatthrivebook.com would be the place for you to connect and learn more and I just really appreciate you guys coming on the show today. Warren – Rich we’re one of your big cheerleaders. Ryan – That’s right. Tell the other guys hello for us as well. Rich – Will do. I’ll do that for sure, I was telling them that we were interviewing today, so I’ll do that.